The Dow Jones Industrial Average is down after news out of Cyprus outweighed a better-than-expected housing report. As of 1:15 p.m. EDT the Dow is down 65 points, or 0.45%, to 14,387. The S&P 500 is down 0.85% to 1,539. There was just one economic release today. Following yesterday's poor homebuilder confidence numbers, investors were relieved to see positive housing data. This morning the Department of Commerce reported that housing starts increased 0.8% to a seasonally adjusted rate of 917,000, up from January's 890,000. February's results are 27.7% higher than the February 2012 rate of 718,000. The positive housing-starts data shows continued strength in the housing market, which was a boon for the economy last year. The number that really deserves a closer look is the positive building-permits figure. Building permits rose 4.6%, or 42,000, to a seasonally adjusted rate of 946,000. Building permits are an indication of future housing starts, so when building permits rise it's a good sign of future housing-market strength. 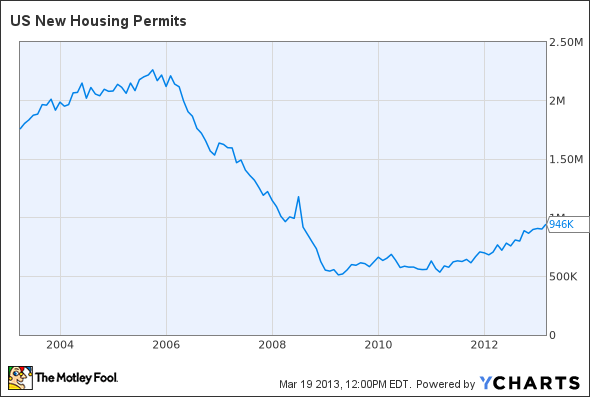 US New Housing Permits data by YCharts. The housing market took a beating in the most recent recession, but activity rose significantly last year. If the housing market can continue to improve, it bodes really well for the U.S. economy. Still, the stock market is overlooking the positive news, as Cyprus' parliament is currently abstaining from a bailout vote, while the Cypriot finance minister has reportedly submitted his resignation. Cyprus is in turmoil as European leaders argue over how to bail out the country's bankrupt banks. Investors are worried that if the country follows through on its plans to institute a one-time tax on bank accounts in the country, a run on banks could occur across Europe. If you want to know more, Fool banking analyst Morgan Housel took a long look at the situation in Cyprus and what it means for investors. Today's Dow leader is Coca-Cola , up 1% to $39.14 on no real news. The beverage giant's results are largely unaffected by the health of the economy, so the news in Cyprus isn't scaring off Coke investors. Last week the company finished down 1% as Chinese authorities announced an investigation into Coca-Cola employees' use of GPS devices. Some mapping and geographic information is regulated in China due to concern for "national security." There's a lot to like about Coca-Cola. The company currently yields 2.9%, has the top two soda brands in the U.S. in terms of market share, and is expanding around the world. Investors and analysts are taking note of the company's increasing dominance over PepsiCo, and just last week an analyst from CLSA upgraded the stock from underperform to outperform. The second-best Dow stock today is Bank of America , up 0.5%. Bank of America's results are largely dependent on the U.S. economy. With today's positive housing reports showing continued strength in the housing market, Bank of America should benefit over the long term. Last week Bank of America got a vote of confidence from the Fed, which approved its plan to buy back $5 billion worth of stock over the next year -- a good investment, as the company currently trades below its book value. The third top Dow stock today is Travelers , up 0.45% after the U.S. Supreme Court ruled in favor of the company. The decision, while not deciding the case, rules that the case should be tried in a federal court and has long-term implications for lawyers trying class-action suits. Lawyers for the plaintiff argued that the case should be tried in a state court, but Travelers wanted the case tried in federal courts, which tend not to be overly friendly to plaintiffs, unlike certain state courts. In the long term, this is good for Travelers as it should lead to fairer class action lawsuits, which should lessen the amount of frivolous class action lawsuits going forward. Should you top up on Coca-Cola? Coca-Cola's wide moat has helped provide its shareholders with superior gains in the past, but the company faces some new threats to its continued market dominance. The Motley Fool recently compiled a premium research report containing everything you need to know about Coca-Cola. If you own or are considering buying shares in the company, you'll want to click here now and get started! The article Today's Top 3 Dow Stocks originally appeared on Fool.com. Dan Dzombak can be found on Twitter @DanDzombak or on his Facebook page, DanDzombak. He owns shares of Bank of America. The Motley Fool recommends Coca-Cola. The Motley Fool owns shares of Bank of America. Try any of our Foolish newsletter services free for 30 days. We Fools may not all hold the same opinions, but we all believe that considering a diverse range of insights makes us better investors. The Motley Fool has a disclosure policy.